Woven hemp necklaces are one form of macrame that continues to be popular to this day. While some necklaces incorporate beads and hug the throat as chokers, others use pendants. When incorporating a pendant into a hemp necklace weave, it's important to pay attention to both the positioning of the pendant in the length of the necklace and the way you position the pendant in relation to the knotting process. Figure out how long you want your necklace to be and create a guide string. Attach the pendant to a spare piece of hemp cord and wrap it around your neck. Trim the cord at the length where the pendant hangs where you want it to. Mark the middle of the string with marker. Remove the pendant. 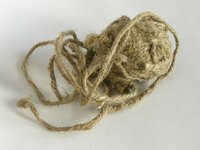 Prepare four lengths of hemp for the necklace weave. Make two of them twice the length of the guide string and the other two at least six times the length. Line up these four strings and attach them with a single knot at one end. Weave the hemp. Hold the string bundle with its knot protruding from the top of your hand, as you would if you were about to braid the strings. Position the two longer strings on the outside of the bunch and the short strings on the inside. Cross the long string on the right over two center strings, then weave it under the long string on the left. Grab the left string and cross it under the center strings, bringing it to the right side. Form a knot by weaving that same string through the loop that will now have formed by the strand on the right. Pull taut, then repeat to form a spiral hemp weave (see the link below for a diagram of this process). String the pendant. If your pendant has a hanging hole (or the center of a jump ring or hoop) that runs from side-to-side, incorporate the pendant into the weave by stringing it onto one of the longer outside strings. Slide the pendant close to the rest of the weave before continuing to weave the strings on the other side of it. If the hoop or hole runs from the front to the back of the pendant, thread the pendant on the outside string in the same way, but tie a knot in that string, wrapping the string around on itself to the other side of the pendant, just by the rest of the weave. This will flip around the pendant's position to make it face forward. Finish weaving the hemp on the other side of the pendant. As you work, judge the length by folding the necklace in half, creasing it at the point where the pendant hangs. Weave until both sides are the same length. Tie a necklace clasp piece to one end of the necklace and a jump ring into the other side. Double knot to secure them and trim the excess hemp.